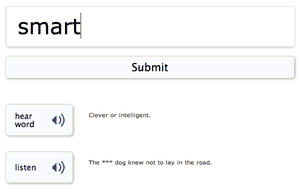 At LearnThatWord spelling tests are integrated into every spelling practice. This helps us understand what the problem words are and to provide targeted and effective assistance. Let LearnThatWord take care of "" for you. We determine which spelling words need more practice and then review them until they're learned for life. Every spelling test is custom-designed, so it works for all ages and all students, from the struggling to the advanced. Create your FREE account now for effective spelling word practice. Registering opens your student portal. Start your first practice session now!